I have a Dreamweaver Tutorial to share today – using embossing paste and using a stencil as a template for a scrapbook layout background. This post is also on Paper Craft Planet blog … so leave me a comment there as well for an opportunity to win a brass stencil of your choice!! The quality of Dreamweaver brass stencils are the best I have used. Before I get to my project, I should say if you have never used embossing paste before, you should definately try it. The raised effect after the paste has dried is reall something now and you can add all kinds of glitter, pigment powders to get this awesome 3D/textured/glittery look to your image. Here is my project. I am so happy I can use these stencils on my layouts too – not just for the background but also to make my custom embellishments. This is a layout of our very hot summer vacation to Hong Kong this year – it’s really hard for me to find Asian inspired embellishments and Dreamweaver has just the stencils for the job. I created the background of my layout first so there was time to dry before I added my photos and papers. Also gave me some time to muster up the courage to use the embossing paste. First, I swiped a couple of stokes of distressed stain on the background; then I inked up the part of the Big Dot stencil with distressed ink along the entire length of the background. After I’m happy with the stenciled background, I spritzed and dribbled a bit of mist randomly around the stenciled image. Let the background dry as I work on the lanterns. Gather all your supplies for using the embossing paste – as a beginner, I can never work fast enough before the paste start to dry. See the left side of the pink lantern where the paste has oozed beyond the image – that is from not taping the sides of the stencil down. Back on task – spread your paste on the stencil using the palette knife – like you are icing a cake – about 1/8″ to 1/4″ thick. Scrap off the excess paste with your spreader like so. Remove the tape from all 3 sides, leaving the top as a hinge, so you can cleanly remove the stencil from the wet paste. I fussy cut my lanterns out and by this time, your background would have been dried and I just assembled my papers and photos as you see on my finished project. What a fun and easy way to create a layout with embellishments that are just totally customized and unique to my photos. Thanks for stopping by and for leaving me some love! Get ready to be inked, pasted, encrusted, stenciled and stamped! All of this week the Dreamweaver Stencils’ Dream Team and the Stampendous Design Teams have been providing some “Dream-pendous” inspiration for you, with multiple opportunities to win some fabulous prizes from both companies. Today is the final hop of the week where you will be directed from both the Stampendous Impressions‘ blog or the Dream It Up! blog to the players du jour for your oohing and aaahing pleasure. This is your opportunity to see how to mix and mingle your creativity…if you are a stenciler, you will be fascinated at combining stamps with your first love. If you are a stamper, you will be wowed at how stencils can add to your impressions. Lynell sent over some amazing products from Dreamweavers Stencils that I have never used before – on this card, the pearlescent Embossing Paste and the Rose colored mica f/x irridescent powder and she also sent that gorgeous flourish stencil as well. Thanks so much Lynell. I have a new found love – brass stencils and I’m definately going to try out that paste again. My butterfly is from Stampendous. I love the dark ink line of this stamp – such a bold look and makes it super easy to fussy cut out as well. Leave me some love before you “gear up” for the next player! We’ll give away 3 of these prize packages this week. One for all the blog comments from the week combined and two for comments on the blog hop today!! - my Stampendous butterfly was die cut and colored and stickled for another card but I discovered it was too big so it’s been sitting on my craft table waiting for another opportunity to be used. Come join in our challenge. Don’t forget – we want YOU to play along with is! You have until Thursday, May 3, 2012 at 11:59 PM EST to add your direct link to our collection at the end of this post (or on the Stampendous blog). 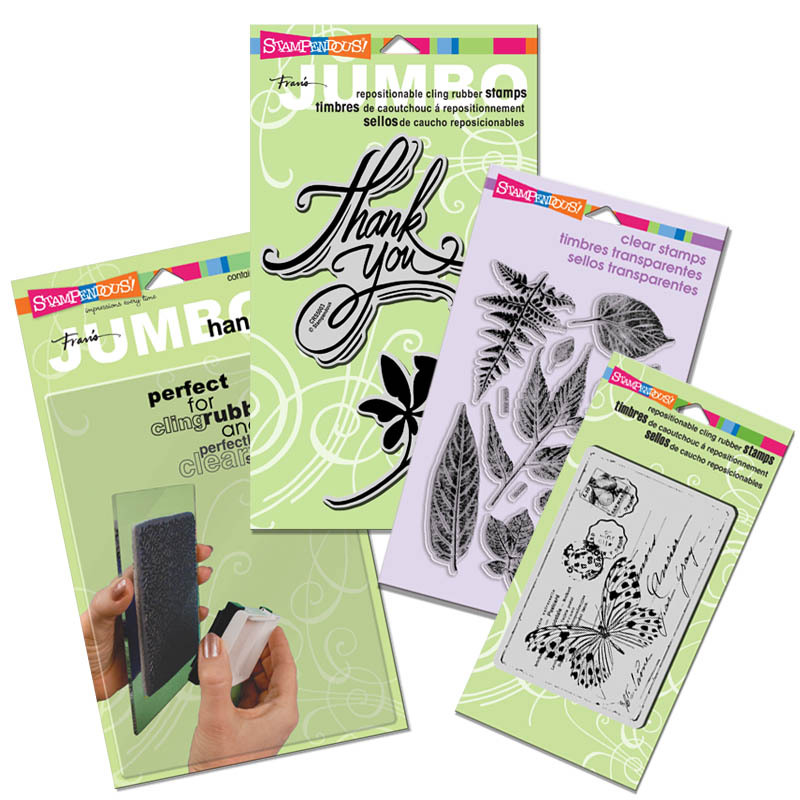 You do not have to use Stampendous products, but we sure love it when you do! As an extra incentive for playing along, one lucky crafter (drawn at random) will receive this fabulous Mother’s Love Perfectly Clear Stamp Set. Available in stores now, it will be on the website for purchase soon! All of this week the Dreamweaver Stencils’ Dream Team and the Stampendous Design Teams will be providing some “Dream-pendous” inspiration for you, with multiple opportunities to win some fabulous prizes from both companies. Each day this week, you will be directed from both the Stampendous Impressions‘ blog or the Dream It Up! blog to the players du jour for your oohing and aaahing pleasure. Everyone will be playing on Saturday, the 14th with our final hop for the week. This is your opportunity to see how to mix and mingle your creativity…if you are a stenciler, you will be fascinated at combining stamps with your first love. If you are a stamper, you will be wowed at how stencils can add to your impressions. I am addicted to so many things on this card – the beautiful bird stamp, the soft blue fragments and glitter from Stampendous, the soft, flowing, repetitive background from Dreamweaver Stencils, that super sweet patterned paper from My Mind’s eye and that delicious May Arts ribbon. Thanks Laura for including that in my package. Dreamweaver and Stampendous totally works on a card without much effort and pair them with some pretty papers and ribbon and you get my style! We’ll give away 3 of these prize packages this week. One for all the blog comments from the week combined and two for comments on the blog hop this Saturday. Be sure to join us each day and Saturday, April 14th at 8 am EDT for your opportunity to be stamping and stenciling alongside our designers.